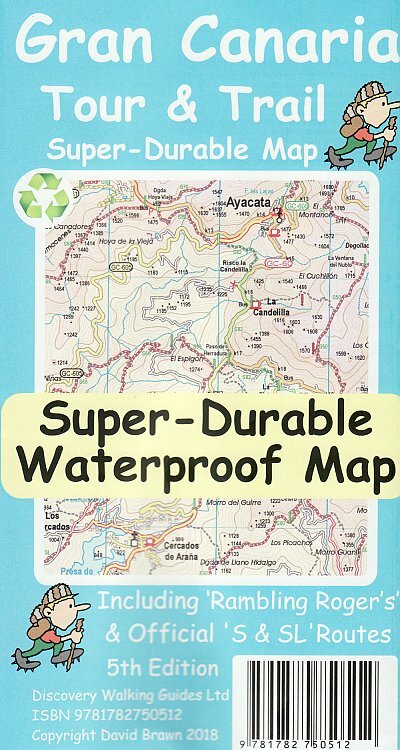 Water-proof, split-proof, tear-proof, adventure-proof. 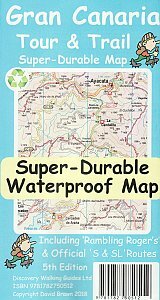 Gran Canaria Tour & Trail Super-Durable Map is simply the toughest, most accurate, easy to read, easy to use map of the island you can buy at any price. David & Ros Brawn have partnered with Gran Canaria's hiking experts 'Rambling Roger', Isabelle and Dane; five researchers with mapping gps units who have surveyed Gran Canaria in detail to produce this map. New for the 3rd Edition are new style highlighting of official and Rambling Roger walking trails making these trails easier to find on the map and easier to follow on the ground, along with a comprehensive updating by our trio of hikers. The official network of hiking trails are highlighted in green, plus 'Rambling Roger's' walking trails are highlighted in red. Large, 50k scale, easy to read map sheets include a wealth of useful details. 20 metre and 100 metre contours combined with altitude shading bring these impressive landscapes to life. Printed on Polyart using specialist 100% oxygenation inks produces a lightweight map that feels like silk but is a tough as old boots as it shrugs off water, resists tearing and damage better than any other map. 'Super-Durable' combined with our special concertina map fold means this 'near indestructible' Tour & Trail Map unfolds easily for use, and more importantly folds back up easily to its compact pocket size even after the toughest use.